People often think of Montgomery County as a place where you go to buy a big house with a yard, and in many areas that's still the case. But most households live in townhomes or apartments, and that share will only increase in the future. A single-family house in Silver Spring overlooking townhouses being built, with apartments in the background. Photo by the author. 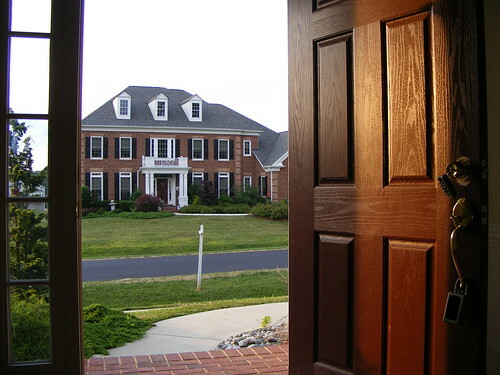 There are nearly 376,000 homes in Montgomery County according to the 2008-2012 American Community Survey. Less than half, or 48.5% are single-family detached homes. One out of three homes are apartments or condominiums, while another 18.2% are "single-family attached" homes such as twins and townhouses. But different kinds of homes are clustered in different parts of the county. Single-family homes predominate on the more affluent west side and inside the Beltway. Townhouses are more common in newer neighborhoods far outside the Beltway, while apartments cluster along the Red Line and in farther-out areas. Not surprisingly, single-family homes predominate on Montgomery County's rural fringe, and in suburban areas. In several neighborhoods, particularly west of Rock Creek Park and in the far northern part of the county, single-family homes are the only type of housing, such as Parkwood in Kensington, Rollingwood in Chevy Chase, and the Town of Chevy Chase itself. 99.5% of all homes in Bethesda's Bradley Manor, recently named the nation's second-wealthiest neighborhood, are detached houses. Areas with a concentration of single-family homes. All images by the author. 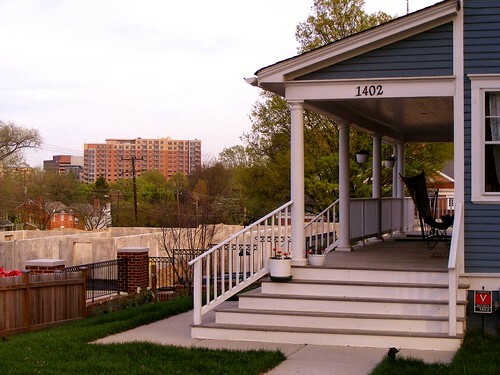 Single-family homes are also very common in older neighborhoods inside the Beltway, which were built early in the 20th century when the county first began suburbanizing. Today, they sit in close-in, highly coveted locations, very close to Metro stations and major job centers. Meanwhile, farther-out areas have a much more diverse mix of housing. If you're looking for a townhouse, you may have to look far beyond the Beltway. The county's largest concentrations of attached homes are in parts of Germantown and Montgomery Village, where townhouses comprise over 70% of all homes. Other areas include Westlake, next to Montgomery Mall in Bethesda; Dalewood Drive, across from Wheaton High School, and Westfarm in White Oak. Areas with a concentration of townhomes. All images by the author. Why is this? The county's 1958 zoning code and subsequent 1964 General Plan established specific "urban" areas where townhomes and apartments would go. Meanwhile, older, close-in neighborhoods began fighting the construction of anything that weren't big, expensive single-family homes. So townhouses got built farther out, where land was cheap and the zoning allowed them. Multi-family homes in Montgomery County tend to fall into one of two camps. You'll find clusters of them around Red Line stations, especially in Silver Spring, Bethesda, and White Flint. These are usually high-rise and mid-rise buildings, and they're often more expensive. The rest are mainly cheaper garden apartments outside the Beltway in areas like Briggs Chaney, Aspen Hill, and parts of Gaithersburg. Areas with a concentration of multi-family homes. All images by the author. Notably, areas with the highest concentrations of apartments also have a lot of young people, a high rate of transit use, and a low rate of car ownership. But those living in apartment clusters farther out don't have the same access to shops, jobs, and transit as those in areas like Bethesda or Silver Spring. Creating more town centers in other parts of the county, like at White Oak, will allow those residents to have more access to economic opportunities. Single-family homes are still the most common housing type in Montgomery County, and more will continue to be built. But they'll make up a decreasing share of the county's housing stock. Between rising housing costs, increasing traffic, and a diversifying population that's also getting older, there's a growing demand for different housing choices. Single-family homes like this one in Olney are still being built, but not as many as there were. As of this April, there were 36,038 approved but unbuilt homes in the development pipeline, most of which will be built in town centers like Silver Spring or Bethesda or in Clarksburg, the county's one last greenfield area. Just 8,644, or 24% will be single-family detached homes or townhomes. And that doesn't include homes that are allowed under zoning but haven't been approved. 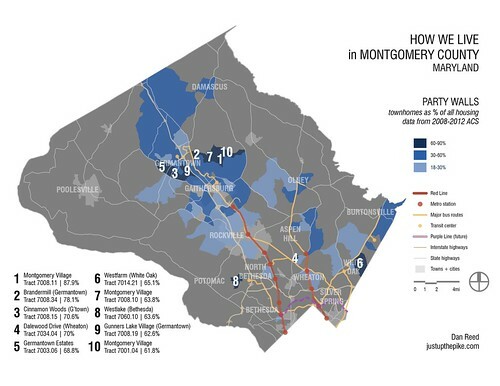 This is a big shift for Montgomery County. While the county has sought to concentrate growth near downtowns and transit lines since the 1960's, many residents and community leaders still think of it as an exclusively suburban place. But in the coming years, the definition between city and suburb will continue to blur. Never realized I was one of the few and the proud by owning a single family home in MoCo! But I'm sure in terms of coverage there is much more SFH area - apts and townhomes to a lesser degree are denser in terms of population.